For the larger part of the new millennium the need to be mobile has increased exponentially. You can no longer stay at the top of any given industry if you don’t spread out or move. We here at Removal 24 have got all of your relocation needs covered. We would not be exaggerating if we were to claim that we are, in fact, the best removal company regionally. We have existed for many years in South West London, now, and we have lived through the changes in the moving business and its extremely rapid expansion, a side effect of which was the rise of many incompetent relocation firms. If you rely on us to get the job done, however we can guarantee you that you will not be disappointed. we have a flawless record spanning hundreds of relocation jobs. We doubt you will find any of our former clients failing to praise or recommend us. Why are we so good? Our unprecedented success of our SW moving team was the product of many independent factors that we care to always maintain favorable for our prosperity. Keeping a reputation like ours demands complete devotion to our work. Our employees are the heart of our South West London moving company, which is why we need them to be always up to par. When we choose them we thoroughly look for traits like handiness, carefulness and motivation that will translate well into the quality of their work. Once they have made it through the initial selection they are required to undertake a lengthy training course that turns them into masters of all thing removal related. We believe that you are as good as your tools, and in our case this would mean rather impeccable. We spare no expense when buying our equipment to ensure no mishaps take place while we are working. Our packers use only high grade, environmentally friendly materials and out drivers have access to one of the most technologically advanced vehicle fleets in the industry (especially in South West London, SW). We are available by phone or through our online booking service. While our main focus is on moves of commercial nature on the territory of South West London, we offer plenty of supplementary services that are invaluable to the work of any given firm. Our storage service for example is both convenient, cheap and safe. The storage facilities have weather control and are secured with live guards as well as CCTV cameras. They are located in convenient places and have the capacity for somewhat large loads. All items stored there will be insured. An added benefit is the availability of our transportation service which you can use in conjunction with this one for quick and speedy storage and deliveries everywhere in South West London, for a very negligible cost. Keep in mind that you don’t have to face full-scale property relocation in order to work with us because we always have the workforce and technical capacity to organise and carry out single-item removals in South West London. Our delivery services are reliable and can be used for the hauling of everything from small and fragile objects to large and heavy items. Know that we maintain nationwide coverage and that we work with most furniture stores in the area. The history of London dates back millennia at end. There are signs even of stone age activity, however the first true settlements were around roman time. The often changed hands between the invaders and the local tribes until the Norman invasion when it became the seat of the crown. Today London is a huge multicultural community numbering in the excess of 8 million. 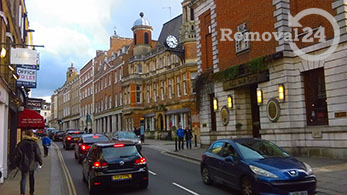 The river Themes separates the city into two large parts – North London and South London, the latter of which is historically newer and serves more often as a residential area. Hampton Court Palace is perhaps the most famous landmark in the South West London. The structure dates back to the 16th century and was acquired by King Henry VII in 1529 when Wolsey fell out of his favour. The palace has been owned by the British Royal Family since then and today is one of London’s most emblematic and well-known edifices. The annual Hampton Court Palace Festival is held at the site. Office removals in South West London are of course our forte, but you should not forget that we offer a range of relocation services that all people from the region are more than welcome to make use of. If you are moving homes in South West London, just let us help you so that you are spared from the stress, hassle and strain that are traditionally associated with such project. Our helpful and fully certified professional movers are going to take care of all the details for you and would not spare an effort when tackling the task you have hired them for. The most certain way that we at Removal 24 are ready to meet the requirements of any South West London removal that can possibly be thrown our way is to maintain a fleet of modern, clean, GPS navigated transit vans that come with all the necessary safety gear. We are proud of our Lutons and Lorrie trucks because they are really suitable for jobs of any scale, nature and level of complexity. One thing is certain – they are the tools for a stress-free office removals in South West London that really make the difference. We will choose the right vehicle for your project depending on scale, nature and the type of goods to be transported. One should not forget that South West London is home to Kingston – an area with very tight relations to the early history of the British monarchy. It was the place for coronation of Anglo-Saxon kings in the 10th century and because of this today the borough of Kingston upon Thames has a royal status. At the current moment the boroughs that make up south west London have a population of roughly 1.6 million.